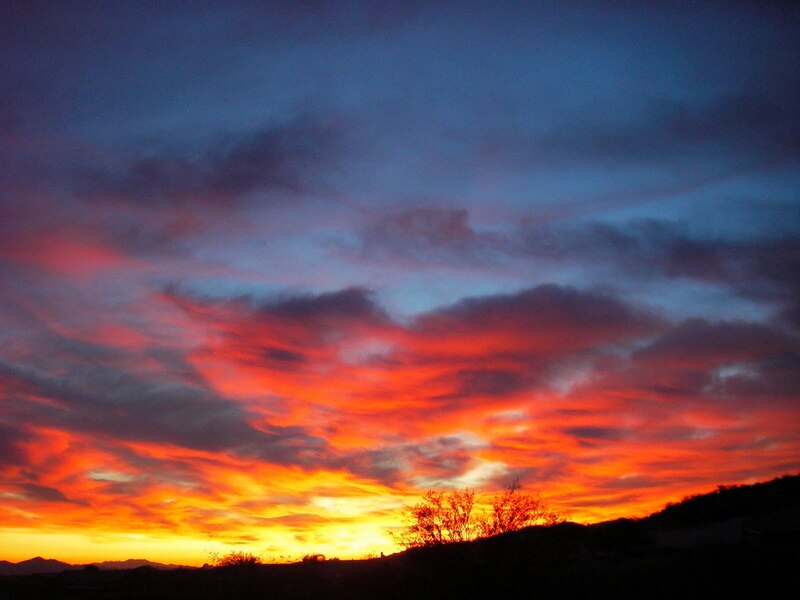 An Arizona Sunset, sooooo sweet! Monday night Judy and I went to a training program about refugees. It was put on by the Tucson Refugee Mission. We actual got involved with a refugee family last December. A Congolese family of ten. Dad, Mom and eight kids, ages 2 – 19. They spent the last 5 years in a refugee camp in Kenya. They speak a Congo language they grew up with, then a military Congo language, then French, Swahili, and now they are learning English. They have been in the USA almost six months now. We brought them to our home for a Christmas meal. Then they had us over for a Congolese meal. We were the first American home they had ever been in. Most refugees never get invited to an American’s home. They still haven’t been able to get a job. Its a difficult time right now. They have had a lot of help from refugee settlement organizations. There are ten different ones in the USA. Three here in Tucson, the Catholics, the Lutherans and the International Rescue Committee. Then refugee aid organizations like the Tucson Refugee Mission. But as time goes on, the help gets less and less. New refugees are always arriving, about 1000 a year here in Tucson. Officially a refugee family is suppose to be 100% self sufficient four months after getting to their new host country. From the training we had I learned that when a family is driven from their home by the effects of war and if they can make it to a refugee camp and feel that it would not be safe for them to return to their home, they can apply for refugee status. The the UN does a background check and interviews, (which can take anywhere from two to thirty five years!!!!) depending on a lot of factors. Once the person or family is approved, they get shipped to the next available country. They have absolutely no say in where they go. Russia, Germany, USA, France, many of the European countries, South America, parts of Asia, etc. Can you imagine, leaving your home with only the clothing on your back, walking for ??????? miles….. finding the refugee camp, crowded with 10’s of thousands of people also wanting to get away from the effects of war. Its absolutly incredable whay mankind puts mankind through. What we are doing now. We stayed in Tucson after the Jaars aviation program ended, because Jordan was doing well in high school and we didn’t want to mess that up. Then we decided we would stay until he was able to be 100% on his own. He moved out a few months ago and is now 98% self supporting. We thought we were going to head over to Chad as facilities maintenance manager and things were moving in that direction. Then we went to visit my dad. He is 90 now. I got this distinct feeling that now was not a good time to go to Chad because of my dad. He is the sole care taker of his wife (92) who is very frail. The stats indicate that because he won’t accept help in taking care of her, (we tried all kinds of ways to give him help) he probably won’t live that much longer. I felt like leaving right now would be saying to my dad, “have a great death and we’ll see you in heaven”. Maybe its just me, but I wasn’t comfortable doing that. So right then this Wycliffe job in Tucson opened up, “retirement facility manager”. I applied and got it. But Wycliffe requires we have 100% of our support before starting a new job. We are currently at 77%. So my current job is Partnership Development. Judy’s planning on staying in Recruitment. We still want to go to Chad and are planning for it in two years. We now have some time to get our French back up to par and get a good grip on Arabic and Chadian / Islamic culture. There is a three day Islamic culture intensive program here in Tucson, we hope to take when the finances come around. Author jimjudywycliffejourneyPosted on January 25, 2010 Categories new newsLeave a comment on What we are doing now. March 5 at 6:3O p.m.
A potluck meal is planned. Danny or Doris will contact you. and a question and answer time. We will call you in a couple days. 2. Follow up the invitation with a personal contact to see if they plan to come. Plan a potluck meal so that everyone invited participates by bringing something. A potluck provides a warm social atmosphere where everyone feels a part of the group and allows them to get to know each other. During the follow-up call you can work out their part in the potluck. 3. If your friends are not the potluck type, or the situation dictates that a potluck won’t work we will be happy to pay for the meal. Just let us know. 4. Introduce the missionary to the group. Tell something about how you came to know your friends and why you feel it’s important for their friends to become acquainted with Wycliffe and this missionary. If you are a prayer or financial part­ner, it’s helpful to tell what this involvement means to you. Your friends will be inspired by what God is doing. They’ll gain a better understanding of missions and the role of Bible translation. They’ll enjoy fellowship with friends and the opportunity to make new friends. Everyone feels the need to be involved in something worthwhile and of eternal value. Some of your friends may have wanted involvement but haven’t known how. If you enjoy getting together with friends, we have a GREAT reason for you to do it. Just edit the below letter and send it to several of your friends. In a couple of weeks, March 1-6, we’ll be in Escondido for a memorial service and to visit some of our friends and relatives. Judy and I would enjoy visiting with you. We had a good time when you and the Tustisons were here in December. You’ll probably remember from our last newsletter that we still have a way to go to reach the monthly budget figure that Wycliffe set for us. In fact we can’t start our assignment until our financial team is complete. With Wycliffe needing to bring in 7,000 new members by 2014 in order to continue the pace of Bible translation, we really need to get on board with our Mobilization team, our future role, which will carry the bulk of recruiting. We are grateful that friends like you have been faithful prayer part­ners with us. Others have joined our team and for that we are grateful. But we still need to see the Lord provide more partners. We’re asking a few friends to consider helping us in a different and special way—by hosting a home meeting. It can be a potluck or bar-b-q where you invite a few of your acquaintances to your home for a “Window on Wycliffe”. This will give you the chance to introduce us, and we’ll have an opportunity to meet these friends and present the challenge of Bible translation. We would like to talk about Wycliffe’s Vision 2025, the exciting things God has done since starting the vision, the many opportunities for others to serve as missionaries with Wycliffe, and we’d like to explain how individuals, families, and churches can be partners in our ministry. Danny & Doris, would you consider doing something like this? An outline of what the meeting might be like is enclosed. We want you to see what we would do and some of the things you might do so you can pray about it and decide if you’re comfortable with this idea. One of us will call in a week to see how you feel about this. You might have another idea you would like us to try. We’re open to almost anything. Would you put our trip and our need for more partners on your prayer list? One of life’s blessings is being able to provide for the needs of others. If you believe that everyone deserves to have the Bible in a language they can understand, why not give to support the work of Bible translation? Maybe you don’t have much money, maybe you don’t work, or maybe you have a steady income. Either way, why should you give to missions? What can five, ten or a hundred dollars do? More than you think. That five to ten dollars a month could make you a monthly partner in the work of a Wycliffe missionary. The cost of the latest CD could pay for the printing of a Bible. The cost of a movie ticket could help pay the expenses of a national translator attending a language workshop. A larger gift can help a missionary keep doing what God has called them to do. A small offering will do things beyond your imagination. That God’s Word is accessible to all people in a language that speaks to their heart. Our motive for Bible translation is that some from all the peoples of the earth might pursue God and His glory. Our quest is to be like Christ. We express this in the way we live and in the quality of the work we do. The Church is sent by God to evangelize the world and disciple the nations. We depend on God for everything needed to complete the otherwise impossible task of worldwide Bible translation. We partner with others to complete the pressing task of translating the Word of God for the peoples of the earth.